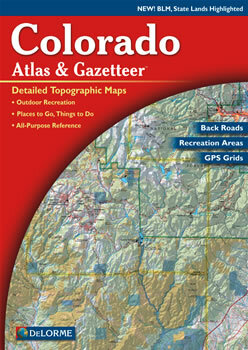 Colorado DeLorme Atlas: Road Maps, Topography and More! Plan your "14ers" climb on a peak over 14,000 feet! Explore Colorado with this Delorme Atlas and Gazetteer! There are 92 large pages of up-to-date shaded relief maps with an index of place names. The back cover of this atlas has a large map of Colorado with an overlying grid. Each cell of the grid contains the page number for a detailed map of that area. The physical features of the state are detailed on these topographic maps showing the creeks, rivers, lakes, ridges, mountains, forests and canyons. Man-made features are also shown, which include: reservoirs, back roads, highways, trails, interstates, place names, airports and railroads. State-wide topographic information is shown by contour lines with intervals of 300 feet or 600 feet, depending on the terrain. There are 12 additional pages of reference information giving detail to points, such as Colorado's campgrounds, public lands, historic sites, "14ers," river trips, wild trout waters, Gold Medal streams, biking, hiking, fishing, hunting and skiing. There is also a two-page map that shows Colorado's public owned lands! You will be impressed with the details and extras this atlas has to offer!